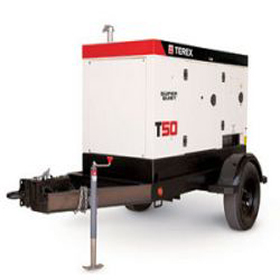 The T50 is powered by a reliable Tier 4 compliant 63.7 hp Kubota diesel engine, efficiently supplying portable power on demand to a wide variety of applications. The T50 offers operators single-phase, three-phase and simultaneous single- and three-phase operation for maximum flexibility of power needs. Three-phase voltages include 208 / 220 / 240 / 440 / 480 while single-phase voltages are 120 / 240.